Like in any form of aviation, a well balanced PPG propeller is essential. I have seen many pilots flying with repaired props that have never been balanced. Unbalanced propellers will cause a premature wear of the above parts, not to mention that can lead to a structural failure in the air or on the ground. I have seen this happen a few times in during the 6,5 years of my "amateur flying career". The last time it happened, the pilot a good friend of mine, had to perform an emergency landing. Luckily enough he was not far from the field. The damage to the machine was substantial. The pilot was unhurt. Attending the Ohio PPG Fly-In (August 01) I had the opportunity to meet many pilots from different states who routinely fly without checking the balance of their propellers.One would be surprised to learn that even a very small repair can cause a serious imbalance, especially in the case of a longer propeller and if done at the tips. I was also amazed after checking many new propellers (of different brands) to notice that they were not very well balanced. 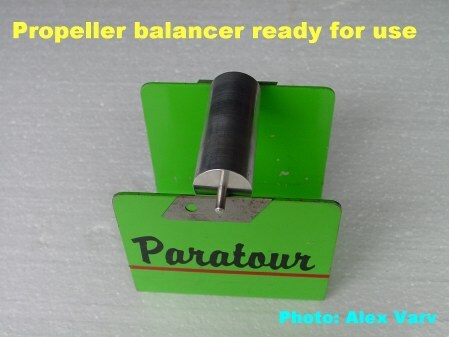 One of the most popular propeller balancer type is the one manufactured and sold by Paratour Canada. It is very sensitive although it does not use wheels on the axle. Working with this device for a few years now, I was wandering if there was anything that could be done to further improve the sensitivity of this device. It is sold at a very reasonable price, for which no one would expect Paratour to use wheels. Besides, this balancer is so sensitive that I have flown many years with the propeller I balanced.This balancer is sold at a more than reasonable price. However, I still wanted to further improve its performance at the lowest possible price. Instead of ordering the wheels (which would obviously increase the cost since they need to be very accurately crafted) my idea was to make the base on which the axle of the cylinder moves, thinner thus to reduce friction to a minimum. I achieved this using two utility knife blades, glued to the sides. 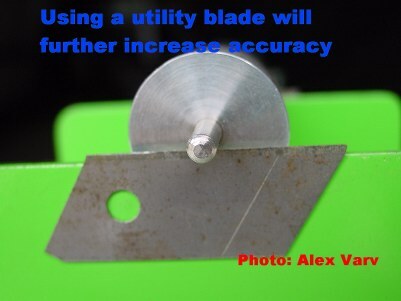 The blades were glued with a fast drying Crazy Glue. They have held for over two years now. Note: There are other types of propeller balancers like the one employing a string. This type is very sensitive and will show not only the longitudinal balance (from tip to tip) but the lateral one as well. The last is caused mainly by a badly centered "hole" by the hub. However the string type is more difficult to work with. The Paratour balancer even if not improved using the above method, is very easy to work with and gives surprisingly good results.